‘Peckham, south-east London. There are over 20 black hair salons in this part of town, each one as invisible as the next to the oblivious passer-by, but to the owners and clientele, these places are life. It’s where hairdos happen and weaves come true but more than that, they’re community comfort zones for women, young and old, from all parts of the diaspora. 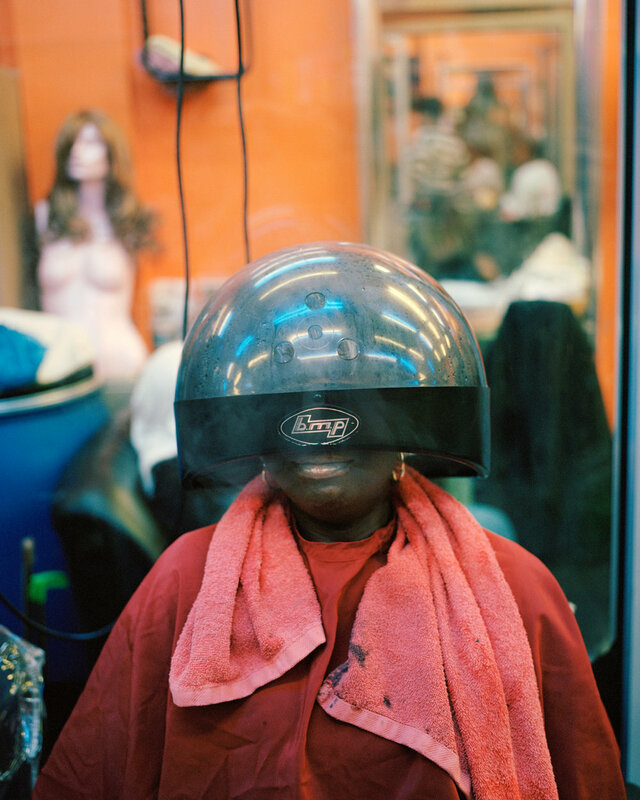 Behind the braids, relaxes, and dog-eared magazines, the black salon is a home from home. Fast-forward through the sleek 1950s, afroed 1970s and Jheri-curled perms of the 1980s to the present day and not much has changed. Even the fact that black women spend six times more on haircare, change styles more often and spend far more time in hair salons has had little impact on the wider industry. A history of reluctance to welcome black custom in white hair salons and the age-old fear of afros has played a big part in keeping the black hair salon alive. If you’ve ever been to such a place, Sophie Green’s photography project, ‘Wefts & Tracks’ will feel so familiar, you can almost smell the braid sheen, catch the jokes and hear the TV in the background. To the uninitiated, like Sophie, it’s a glimpse into a different world. Sophie says it was one of the most difficult projects she’s ever done. Gaining access to the salons was sometimes difficult and persuading people that she wanted to seriously document something usually overlooked was hard. ‘It was absolutely my intention to capture a positive reflection of the community to honour the people I encountered and represent them truthfully and respectfully,’ she says.